Blast from the Past! Recognize the Devotees? ~ The Toronto Hare Krishna Temple! Blast from the Past! Recognize the Devotees? 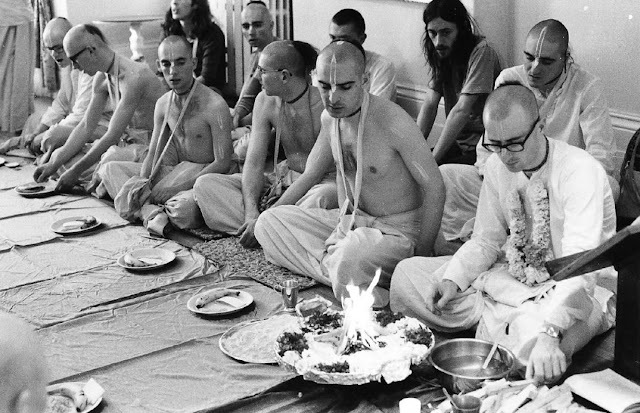 Our dear senior member of our Toronto Hare Krishna community, Praharana devi dasi, sent us this "blast from the past" picture of an initiation ceremony from the early days of Toronto's Hare Krishna community! Can you recognize some of the devotees in the picture? If so, leave a comment with your guesses! Last second person in second row is Bhaktimarg Swami. Correct! There's more! Any more guesses? Harakumar prabhu in the front row, second from left.